Review: A book with many interesting details always makes it a wonderful read. That's why Tighter by Adele Griffin; a two-time National Book Award finalist, is a book that you would want to read and not miss it. Unlike any other book you may have read, Tighter will not "leave you hanging" or be too anticlimactic. Adele Griffin has put a great amount of effort into all her books especially Tighter so you will not be disappointed by her excellent genius. In the beginning of Tighter, Jamie, a 17-year old girl, is traveling to "an idyllic New England island called Little Bly." A distinctive attribute of Jamie is she has a near addiction to pills. She has been hired as an au pair or "baby-sitter" for a little girl named Isa McRae who lives at Little Bly during the summer. What she sees when she goes to find Isa is a ghost couple together people she doesn't know who they are. When Jamie meets Isa, she finds out some interesting about Little Bly's past. The people that Jamie meets and hears about during the novel surprise and astound her and have a bizarre "phenomena" effect on her, whether the people are dead or alive. It is strange what is awaiting Jamie at every turn the longer she stays on Little Bly. Be prepared to be amazed as you read one of the most worthy books ever written. Overall, Tighter is phenomenal; out of this world. It will have readers "marveling in its glory". After every turn of the page, readers are greeted with suspense, comedy, drama, and even tragedy striking the McRae children, Connie, Jamie, and their friends. The unbelievable aspects, actions, and scenarios complete the book; which I give 5 out of 5 stars. The unbelievable truth is awaiting; get the book! You will be in love with it! 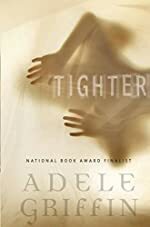 Looking at a book will never be the same after you read Tighter by the wonderful Adele Griffin. You'll have to read it to know it. Review written by Sam P. (6th grade student). We would like to thank Random House for providing a copy of Tighter for this review. Have you read Tighter? How would you rate it?